neighborhood reminded us of Gowanus or Red Hook. 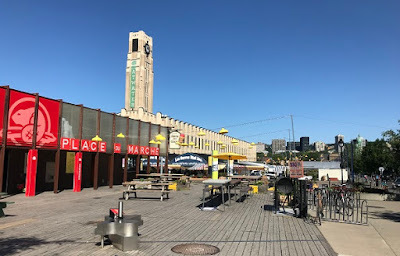 On July 10 we made it under three super-low bridges and docked at Montreal's Atwater Market. We swooned over the fromageries, boulangeries, patisseries, and fresh fruits and veggies. Even more exciting than the formidable cheese selection: we were sharing the dock with another canal boat. It was a distinctive style of vessel: a bateau mouche. You know them as the glass-topped excursion boats that cruise the Seine, in Paris. Even more exciting: this boat was a cafe/bar. No question about our evening's entertainment. We trekked on over. 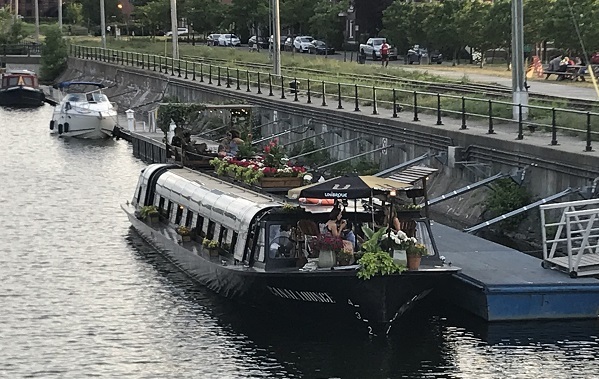 The Canal Lounge (Cafe Flottant) has flowers on the roof, a pair of Adirondack chairs on the bow, and a cushioned, canopied lounging area at the stern. It's as adorable inside as outside: classical nautical style meets high elegance meets nightclub. Fresh flowers on the curved sailboat-style tables. Cut crystal barware. And color-change mood lighting glowing from red to purple to teal to orange. A young man in a crisp white shirt was bustling about and dropped by our table to ask how we were doing. "We love your boat!" we enthused. "We're on a canal boat too!" Our host brought over a photo album and told us a little bit about the boat's history, sparking an enthusiastic conversation that continued later that night, when the two owners finally closed up and came down the dock to have a glass of wine on OUR boat. Gurvan Bartholo and his spouse Jeroen Ter Schiphorst never set out to create what Narcity calls "the most romantic place" to have a drink in Montreal. They were flight attendants and happy with their life. Then Jeroen spotted this boat in an online ad. It was the exact same scenario as when Cap first met Dragonfly: pure love at first sight. They had to have it. Flowers above, romance below . . . The 42-year-old former tour boat, built in Canada, was in tough shape. Gurvan and Jeroen spent 6 months renovating it, stripping almost every surface, rebuilding inside, painting the hull and superstructure. Then there was the work of negotiating with Parks Canada to anchor a bar in the middle of a national historic site, the Lachine Canal. And the adventure of cruising it up the Ottawa River, which was as bouncy for them as it was for us. But now Canal Lounge is a "must visit." Both local condo dwellers and developers cite it as an important amenity in the neighborhood. The guys have eight employees. A success all around. One of the best things about boating is the people you meet, and how quickly your shared experiences make you fast friends. Visiting with these two crazy, visionary canal boat enthusiasts was one of the high points of the trip so far. 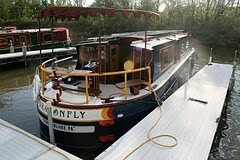 We like to say, only half joking, that our mission is to spread the joys of canal boating across North America. Gurvan and Jeroen are doing the same with Canal Lounge. Hats off to you!